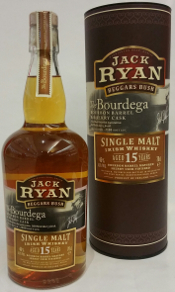 This premium Jack Ryan Irish whiskey is a 15 year old single malt which has been aged in bourbon barrels and then finished in sherry casks – Bourbon and Bodega – Bourdega! No chill-filtration and small batch release limited to 2500 bottles worldwide. Nose: Just cut fresh granny smith apples, candied orange zest, hints of sherry and cut grass. Delicate layers of honey and fresh vanilla cream. Taste: Stewed fruits, hints of citrus and honey. Fresh apricots mixed with creamy yoghurt, tied together with luscious sherry and roasted almonds. Finish: Spicy and smooth, mouth coating sherry, hints of oak with nuts and more stewed fruits. Buy this fine beverage right here at the World of Whisky website. ← EASTER RECIPE IDEAS – HOME COOKING FUN!